6 FUNCTIONS IN ONE TOOL - Includes 6 interchangeable tool bits: 2, 4, 5, 6mm hex, T25 and cross-head screwdriver. EASY TO USE & COMFORTABLE multi-tool set. Ergonomic handle designed to fit in the palm of your hand, to help apply correct force. The non-slip grip provides the right amount of comfort and control. Unique 3-way design offers more leverage than a single wrench. 6 FUNCTIONS IN ONE TOOL - Includes 6 interchangeable tool bits: 2, 4, 5, 6mm hex, T25 and PH2 cross-head screwdriver. 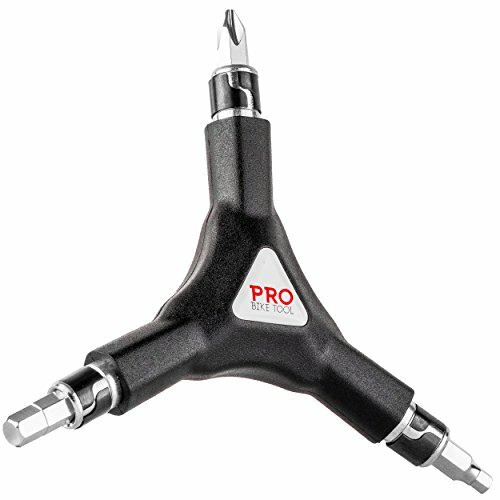 PRECISION ENGINEERING - Suitable for daily use at home, or in a professional mechanic environment. Riveting bead design to firmly secure tool bits when in use. BUILT TO LAST - Tool bits made from very hard, heat treated S2 steel, removing risk or rounding bolts and screws, and built to last a lifetime. Strong, durable but comfortable tough plastic coating around the hard steel 'core' tool.